Superficial chemical peels are considered as adjunctive treatments for the management of acne. , They are often added to first line therapies such as retinoids and antibiotics, whether topical or systemic. , Their addition to the regimen is preferred due to the quick decrease in lesional count as well as the improvement of overall skin texture. A series of chemical peels can give significant improvement over a short period of time, leading to patient satisfaction and maintenance of clinical results. , Chemical peels with increased depth of penetration have also been used for the treatment of acne scars, either alone or in combination with other resurfacing procedures. Chemical peels are generally considered safe and effective, forming an important part of a dermatologist's arsenal. However, the use of chemical peels can have adverse effects, such as post-inflammatory hyper pigmentation that is more commonly seen in darker skin types. Most of the available literature on chemical peels focuses on its role in skin rejuvenation and the correction of dyschromias. While there is no doubt that chemical peeling is widely being performed on Asians for various indications, there is a paucity of published literature on the safety and efficacy of chemical peels specifically for acne and acne scars in Asian patients. The purpose of this review is to summarize and evaluate the existing studies on the role of chemical peels in the treatment of acne and acne scars among Asians. The most commonly used chemical peels in treating acne and acne scars include salicylic acid (SA), glycolic acid (GA), Jessner's solution (JS), resorcinol, and trichloroacetic acid (TCA). More recently, other peels have emerged that been proven useful in the management of acne such as lactic acid, and a salicylic acid-mandelic acid (SM) combination. We conducted a search on PubMed using the terms "acne, acne scars, chemical peels, glycolic acid, salicylic acid, Jessner's solution, trichloroacetic acid, resorcinol, phenol, Asians, Chinese, Japanese, Koreans, Indians, ethnic skin, and dark skin." 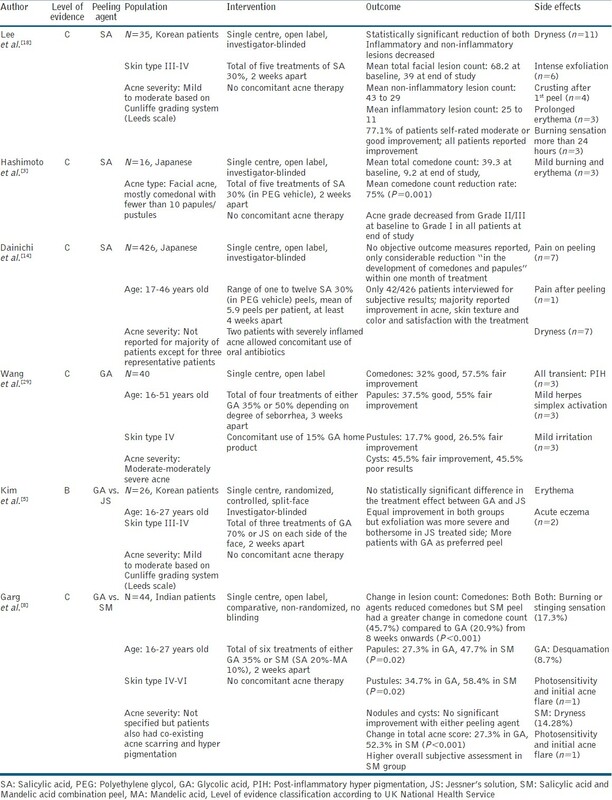 All prospective clinical trials or case series from 1990 to 2011, with Asians as subjects, were included and grouped according to the peeling agent used and the indication, being acne or acne scars. Only studies published in English were included. The level of evidence of each study was determined using the UK National Health Service system. Three open label studies on salicylic acid peels were found with one of these serving as the pilot study for the other. All three studies used 30% SA and an average of five peels was administered to the patients. In the largest study, some patients with severely inflamed acne were allowed to take oral antibiotics simultaneously, with no adverse effects reported. Two studies evaluated a novel polyethylene glycol (PEG) vehicle that reduced the stinging sensation experienced with peels using an alcohol vehicle. In all three studies, there was significant improvement of both comedonal and inflammatory acne lesions, with few and mild side effects reported. One open label study evaluated GA alone in patients with moderate to moderately severe acne while two studies compared it against other peeling agents namely Jessner's solution and a combination of salicylic acid and mandelic acid (MA). An open label, non-randomized study compared head to head, GA against a combination peel containing salicylic acid and mandelic acid (SM). Both GA and the SM peel produced significant reduction in the total acne score but the SM peel was statistically more effective than the GA peel from 12 weeks onwards. A pilot study was done to evaluate the safety of the CROSS technique using 100% TCA among Asians with darker skin types. All patients had good to excellent results however, there was one patient who noticed a reduced effect at three months without further improvement until the end of the sixth month follow up period. All the patients were able to tolerate the procedure well. There was one case each of transient hypo-pigmentation and hyper pigmentation. Following the aforementioned pilot study, the authors conducted a larger study using the same method described. Excellent results were achieved in more than 70% of patients; while 20% of patients showed good improvement and 6.7% of patients had fair results after receiving four peels. There were no cases of neither scarring nor prolonged pigmentary alteration. The authors of both studies concluded that 100% TCA was safe and effective in treating ice pick acne scars in patients with Fitzpatrick skin types IV-V.
A study done in Korea previously evaluated the use of phenol peel, not for acne scars but for small pox scars. However, it was during this study that many side effects were seen such as cardiac arrhythmia. In view of this safety issue, Park and colleagues evaluated the effectiveness of a modified phenol peel also for Korean patients. Seven out of the 11 acne patients had good to excellent results and no cases of systemic toxicity were reported. However, 74% of patients experienced hyper pigmentation. One case had persistent hypo-pigmentation. Though the modified phenol peel was found to be safe and effective in treating acne scars in Asians, it was less effective when compared to laser resurfacing. Chemical peels are considered as adjuvant therapy in treating all forms of acne. The addition of chemical peels leads to a faster clinical response and patient satisfaction. Salicylic acid at 30% concentration and 35-70% glycolic acid has been shown to be effective in reducing both inflammatory and non-inflammatory lesions of acne in Asian skin. Glycolic acid was shown to be safe in the treatment of acne even in darker skin types as well as adjunctive therapy for the treatment of acne scars. Salicylic acid also has the added advantage of having a whitening effect, which is favourable for Asians with darker skin types, as well as those with co-existing hyper pigmentation. Jessner's solution was found to be as effective as 70% GA but the exfoliation it produced was bothersome for some patients. The combination peel of salicylic acid and mandelic acid had superior results compared to 35% GA, which calls for further studies to cement its role as a standard peel for acne. In the treatment of acne scars, the most commonly used peel is TCA at concentrations of 35 to 100% either alone or in combination with another peeling agent, such as Jessner's solution. Lower concentrations are useful for atrophic boxcar scars or rolling scars while the CROSS method using 100% TCA is useful for ice pick scars that are difficult to treat. Another peel useful for more superficial scars is the full strength lactic acid peel. Since it is non-aggressive it is not recommended for those with ice pick scars or deep rolling and boxcar scars. Glycolic acid was also shown to have an additive effect to a resurfacing procedure, and further study may be done to evaluate its utility and efficacy. Phenol however, was associated with a lot of side effects, and was less effective when compared to laser skin resurfacing, considering how tedious the procedure was. However, notwithstanding the level of evidence of the studies that were cited, chemical peeling stands a useful adjuvant in the management of acne and as a first line therapy for acne scars. Most of the peeling agents were evaluated to be safe, efficacious, and easy to administer. Compared to newer machine-based technologies for acne and acne scars, chemical peeling is affordable and with minimal downtime, and can be performed in any dermatologist's office. It is hoped that more randomized clinical trials with larger sample sizes be undertaken in order to strengthen the current body of knowledge on the safety and utility of chemical peeling for Asian patients. This review on chemical peels for acne and acne scars will hopefully aid the physician in designing an optimum treatment plan in Asian patients. 1. Kessler E, Flanagan K, Chia C, Rogers C, Glaser DA. Comparison of alpha- and beta-hydroxy acid chemical peels in the treatment of mild to moderately severe facial acne vulgaris. Dermatol Surg 2008;34:45-50. 2. Taub AF. Procedural treatments for acne vulgaris. Dermatol Surg 2007;33:1005-26. 3. Hashimoto Y, Suga Y, Mizuno Y, Hasegawa T, Matsuba S, Ikeda S, et al. Salicylic acid peels in polyethylene glycol vehicle for the treatment of comedogenic acne in Japanese patients. Dermatol Surg 2008;34:276-9. 4. Kligman D, Kligman AM. Salicylic acid as a peeling agent for the treatment of acne. Cosmetic Dermatol 1997;10:44-7. 5. Kim SW, Moon SE, Kim JA, Eun HC. Glycolic acid versus Jessner's solution: Which is better for facial acne patients? A randomized prospective clinical trial of split-face model therapy. Dermatol Surg 1999;25:270-3. 6. Baumann L, Saghari S. Chemical Peels. In: Baumann L, editor. Cosmetic Dermatology. 2 nd ed. New York: McGraw-Hill; 2002. p. 148-60. 7. Dréno B, Fischer TC, Perosino E, Poli F, Viera MS, Rendon MI, et al. Expert opinion: Efficacy of superficial chemical peels in active acne management--what can we learn from the literature today? Evidence-based recommendations. J Eur Acad Dermatol Venereol 2011;25:695-704. 8. Garg VK, Sinha S, Sarkar R. Glycolic acid peels versus salicylic-mandelic acid peels in active acne vulgaris and post-acne scarring and hyper pigmentation: A comparative study. Dermatol Surg 2009;35:59-65. 9. Goh CL, Akarapanth R. Epidemiology of skin disease among children in a referral skin clinic in Singapore. Pediatr Dermatol 1994;11:125-8. 10. Yeung CK, Teo LH, Xiang LH, Chan HH. A community-based epidemiological study of acne vulgaris in Hong Kong adolescents. Acta Derm Venereol 2002;82:104-7. 11. Handog EB, Macarayo MJ, Gabriel MT. Acne scars in Asian patients. In: Tosti A, De Padova M, Beer K, editors. Acne scars: Classification and treatment (Series in dermatological treatment). 1 st ed. UK: Informa Healthcare; 2009. p. 90. 12. Shah SK, Bhanusali DG, Sachdev A, Geria AN, Alexis AF. A survey of skin conditions and concerns in South Asian Americans: A community-based study. J Drugs Dermatol 2011;10:524-8. 13. Kim IH. Salicylic acid peel (Acne peel). Hong Kong J Dermatol Venereol 2005;13:83-5. 14. Dainichi T, Ueda S, Imayama S, Furue M. Excellent clinical results with a new preparation for chemical peeling in acne: 30% salicylic acid in polyethylene glycol vehicle. Dermatol Surg 2008;34:891-9. 15. Bhardwaj D, Khunger N. An assessment of the efficacy and safety of CROSS Technique with 100% TCA in the management of ice pick acne scars. J Cutan Aesthet Surg 2010;3:93-6. 16. Lee JB, Chung WG, Kwahck H, Lee KH. Focal treatment of acne scars with trichloroacetic acid: Chemical reconstruction of skin scars method. Dermatol Surg 2002;28:1017-21. 17. Goodman G. Treatment of acne scarring. Int J Dermatol 2011;50:1179-94. 18. Lee HS, Kim IH. Salicylic acid peels for the treatment of acne vulgaris in Asian patients. Dermatol Surg 2003;29:1196-9; discussion 9. 19. Ahn HH, Kim IH. Whitening effect of salicylic acid peels in Asian patients. Dermatol Surg 2006;32:372-5; discussion 5. 20. Lai KW, Mercurio MG. Update on the treatment of acne vulgaris. J Clin Outcomes Manag 2009;16:115-26. 21. Berger R. Initial studies show salicylic acid promising as anti-aging preparation. Cosmet Dermatol 1997;10:31-2. 22. Taenaka Y, Hayashi N, Takeda M, Ashikaga S, Kawashima M. Glycolic acid chemical peeling improves inflammatory acne eruptions through its inhibitory and bactericidal effect of Proprionibacterium acnes. J Dermatol 2012;39:350-4. 23. Atzori L, Brundu MA, Orru A, Biggio P. Glycolic acid peeling in the treatment of acne. J Eur Acad Dermatol Venereol 1999;12:119-22. 24. Rubin MG. Manual of chemical peels. Superficial and medium depth. 1 st ed. Philadelphia, PA: J.B. Lippincott Company; 1995. p. 111. 25. McCulloch EG, Langsdon PR, Maloney BP. Chemical peel with phenol. In: Roenigk RK, Roenigk HH, editors. Dermatologic Surgery, Principles and Practice. 2 nd ed. UK, Oxford: Marcel Decker Ltd.; 1996. p. 1147-60. 26. Al-Waiz MM, Al-Sharqi AI. Medium-depth chemical peels in the treatment of acne scars in dark-skinned individuals. Dermatol Surg 2002;28:383-7. 27. Park JH, Choi YD, Kim SW, Kim YC, Park SW. Effectiveness of modified phenol peel (Exoderm) on facial wrinkles, acne scars and other skin problems in Asian patients. J Dermatol 2007;34:17-24. 28. Deprez P. Textbook of chemical peels: Superficial, medium and deep peels in cosmetic practice. London: Informa Healthcare; 2007. p. 206. 29. Wang CM, Huang CL, Hu CT, Chan HL. The effect of glycolic acid on the treatment of acne in Asian skin. Dermatol Surg 1997;23:23-9. 30. Khunger N, Bhardwaj D, Khunger M. Evaluation of CROSS technique with 100% TCA in the management of ice pick acne scars in darker skin types. J Cosmet Dermatol 2011;10:51-7. 31. Sachdeva S. Lactic acid peeling in superficial acne scarring in Indian skin. J Cosmet Dermatol 2010;9:246-8. 32. Sharad J. Combination of micro needling and glycolic acid peels for the treatment of acne scars in dark skin. J Cosmet Dermatol 2011;10:317-23. 33. Yoon ES, Ahn DS. Report of phenol peel for Asians. Plast Reconstr Surg 1999;103:207-14; discussion 215-7.